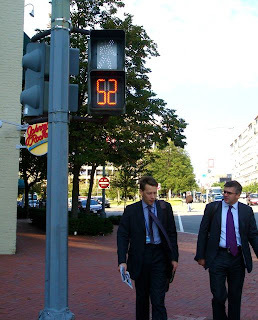 The best way to explore a city, especially a big, vibrant, cosmopolitan city (like Washington DC) is on foot. You might think that you won't be able to see as much as you would if you were in a car, train, or bus - but in fact the opposite is true. The most rewarding parts of a visit to a new city are the small, unexpected details. Everyone's seen the Eiffel Tower or the Empire State Building, but what makes the trip really yours is the little old lady who tells you about what used to stand on that empty lot, or the hidden alleyway filled with colorfully artistic murals. It's only by interacting with the city on a personal level - which can only be done at a human level, i.e. on foot - can you gain the most rewarding experiences from your visit. So, during my first day in Washington, DC, it was a no-brainer that I would spend the day exploring on foot. What would I discover? 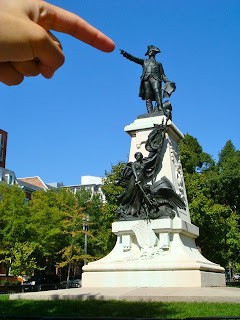 From Leslie's office near Dupont Circle, I walked south along 20th Street. There were office buildings everywhere; the sidewalk was clean and polished; and the restaurants were just opening up and preparing for the lunchtime rush. I stumbled upon the Mexican embassy, not too far from the White House, and then walked onto the campus of George Washington University. GWU's campus isn't laid out in much of a traditional sense; the buildings are interspersed into the neighborhood inconspicuously such that it's hard to tell when you are actually entering the university. It was still early, maybe 10am, so not too many students were walking around yet. 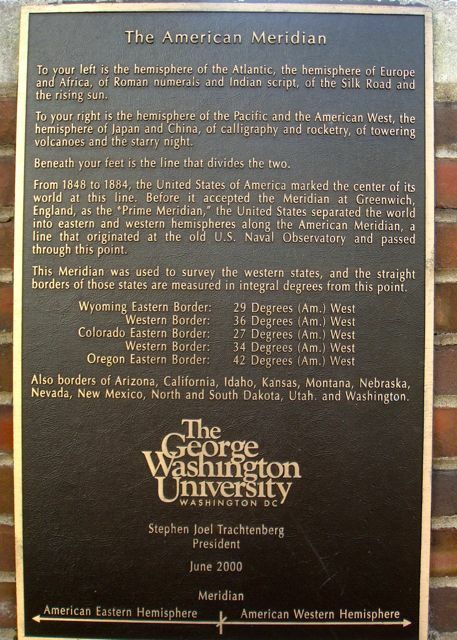 I discovered a plaque commemorating the American Meridian (or, Washington Meridian). It was fascinating, especially for a geography nerd like me, to be standing on the line on which much of the U.S.'s surveying was based. 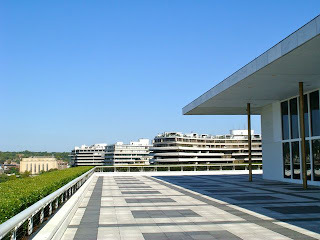 I wandered to the Watergate complex. Just past Watergate lay the Kennedy Center, standing bright and imposing with grand open spaces around it. I had to check out what was inside: I walked into the Hall of States, a huge hallway with the flag of every U.S. state hanging from the walls. 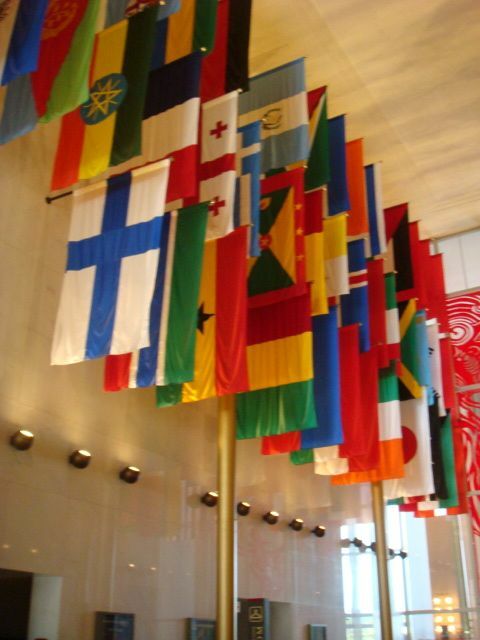 On the other side of the building was the Hall of Nations, containing the flag of every country with which the U.S. has current diplomatic relations. As I glanced at a free pamphlet, a man asked me if I'd like to join one of the free tours which was about to leave in 5 minutes. Why not? I thought. And before I knew it, I was spending the next hour being led around the grand Kennedy Center by the adorable old lady Gloria. The tour group consisted of me and a couple also from southern California (La Verne). It turned out to be an amazing and informative tour - I never realized what a treasure and a cultural resource the Kennedy Center is. Most of the artifacts in the building were donated by other countries to the U.S. after the assassination of President Kennedy: Chandeliers from Sweden; a grand chandelier from Austria; sculptures from France; an assortment of artwork from Ghana, Nigeria, Cameroon, and Côte d'Ivoire; an entire theater donated by Japan; and a wide assortment of artwork from China and Spain. The tour led us into the Opera House and the Eisenhower Theater. 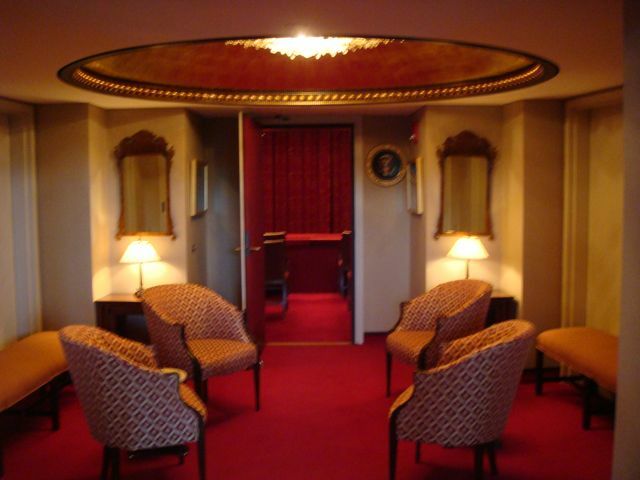 The tour let us peek into the Presidential suites in each of the theaters. 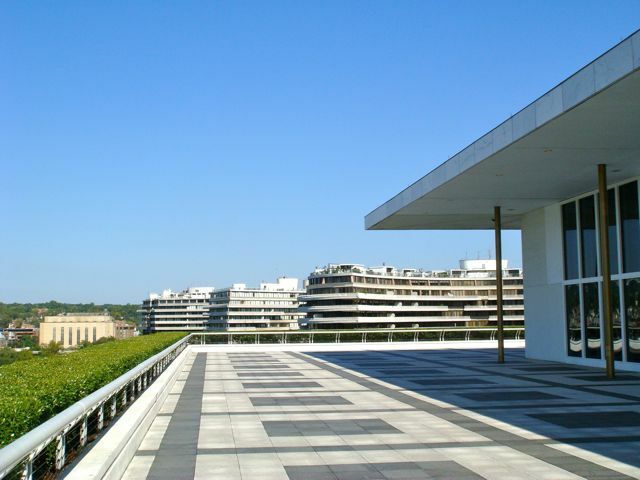 And after the hour-long tour, I was left to roam around the wide rooftop of the Kennedy Center, from which you can take in panoramic views of Washington DC and nearby Virginia. It was almost 12:00 when I left the Kennedy Center, which meant time to meet Leslie lunch! 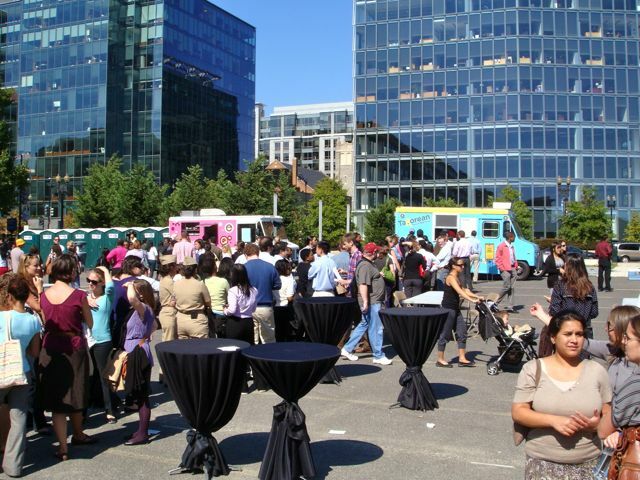 We had planned to meet at a big food truck event called the "Curbside Cook-off" near Chinatown, which was halfway across the city. I walked quickly from the Kennedy Center across the city - passing GWU, the World Bank and IMF, and the White House. It took 45 minutes, and the warm midday sun had made me tired, sweaty, and hungry. 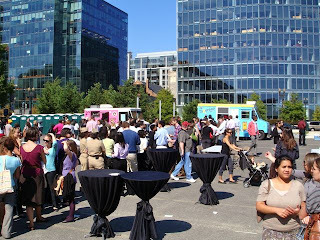 I met Leslie and we walked into the huge parking lot, in which a dozen or two food trucks were parked, and each truck had a queue of at least 100 people each. The choices were overwhelming, from lobster to Korean tacos to icy popsicles, but with all the people waiting for some food, Leslie and I just tried to find the shortest queue. We waited about 10 minutes, barely moving an inch, before we decided to leave. As we were deciding where to go to, we happened upon my friend Jen from Berkeley, who had been waiting for much longer than we had. Leslie and I walked toward Chinatown, which was only a block or two away, and we settled on having lunch at Five Guys. People have compared Five Guys to In-N-Out Burger, but having experienced both, it's easy for me to say that there is no comparison. In-N-Out is fresh, simple, and naturally flavorful; Five Guys's burger had a noticeable staleness which was only masked somewhat by the huge choice of topping they offer for you to customize your burger. The fries were also too salty for my liking. It's also unique for leaving boxes of peanuts open for people to just munch on. It feels like a local's joint, but too stale and sterile to be authentic. The people of DC are dressed so professionally, and yet there are so many young people who seem fresh out of college. And so my overall impression of DC has been that of a career day everyday. I could detect a strong professional work ethic in the atmosphere, but very little creativity or artistry or craziness. It's hard to imagine living like that. Most people I passed seem unapproachable, frazzled and hurried on their way to another meeting, no doubt. Or perhaps they're just weighed down with the realization that their idealism of coming to Washington to change the world for the better must succumb to the realities of our bureaucratic political mess of a system. I parted ways with Leslie and sipped on my Arnold Palmer as I walked around eastern downtown DC. My path eventually took me to the National Mall. There, right in front of the Natural History Museum, two girls asked me where the Natural History Museum was. I saw the sign and pointed them to the building right next to us. They were thankful for my help. I found a shaded spot under a tree and lay down to rest. I fell asleep. With the overnight flight, jet lag, and the miles of walking, I was more exhausted than I had imagined. I awoke half an hour later, slightly re-charged, and checked out the nearby Museum of the American Indian. It was pleasant and clean inside, but I wasn't in the mood for a museum; I was itching to explore more of the city! 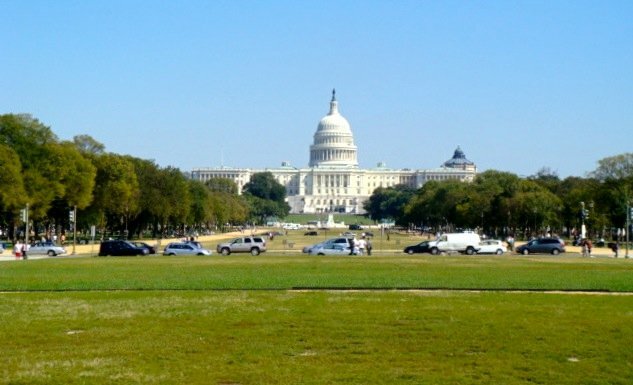 So I stepped outside and was just in front of the U.S. Capitol. 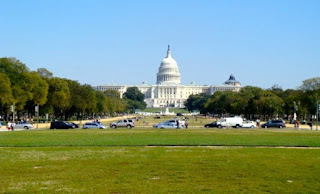 I walked in front of the Capitol Reflecting Pool, taking pictures for myself and for other tourists there. I walked around the pool to the foot of the steps of the Capitol. I sat and stared out upon the National Mall, the Washington Monument in the distance and the grass beaming in the afternoon sun. I rested there for a while, enjoying the fact that I was on the steps of the Capitol of the United States, and watching tourists come and go. A couple of teenage congressional interns, dressed in their suits, exited the Capitol.